Say hello to our new offering! You can now design an A4 calendar using our Easy Designer photobook software, using all the same tools and functionality that you are familiar with. Not enough pics for a full photobook? A calendar needs only a picture for each month and one for the front cover (meaning 13 landscape oriented images at a minimum). Of course, you can use one of our pre-designed layout templates for multiple images, or freely place as many images as you want in each month’s panel. We even have a template that will allow you to place images in empty calendar date cells. 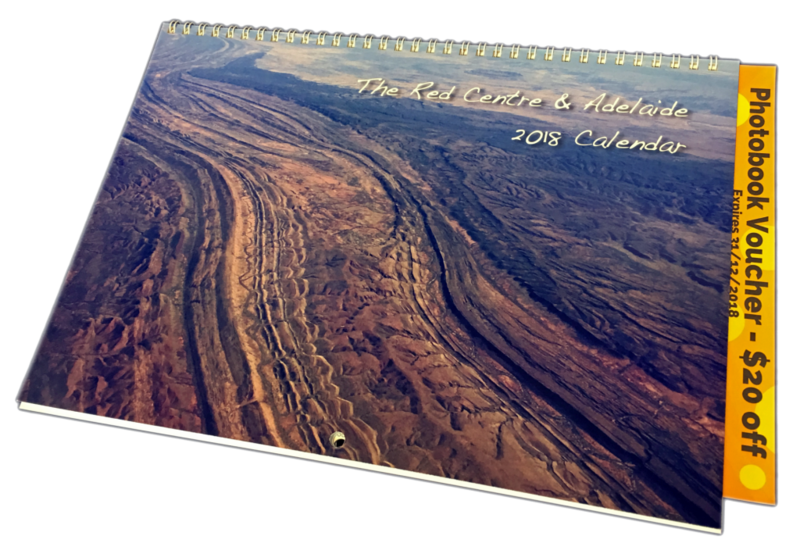 Our calendars are pre-populated with Australian national and statewide public holidays, and as with our photobooks, you can place additional text (such as birthdays etc.) as required. Printed calendar pages use the same high quality 170gsm matt silk finish paper that are used in our books, with a heavier weight stock for front and back pages. Optionally, you may choose to upgrade your calendar to have all pages printed on 300gsm matt silk finish card, for an even higher quality feel. 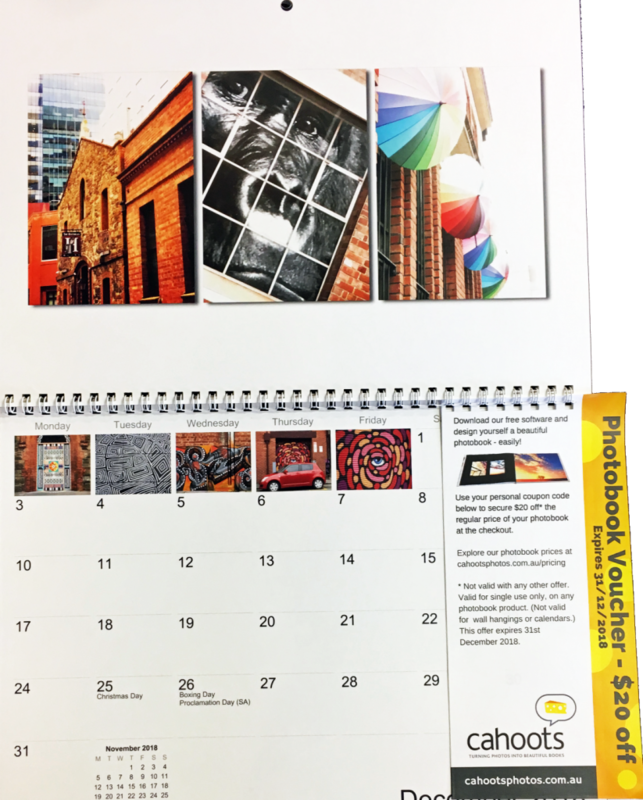 Calendars make great gifts and a Cahoots calendar is unique in that it comes with a $20 photobook discount voucher* valid for the whole 12 month duration of the calendar. So your calendar is two gifts in one! This makes them a great option for corporate gifts, with substantial discounts for bulk orders. We have a number sample calendars for viewing at the Cahoots store, but if you can’t make it you may prefer to take a quick peek at our promotional video on YouTube, which introduces our Cahoots “Let Me Do It” Calendar. There is more to choosing a photobook provider than price, quality and service level. Even if you find a supplier that provides good value and books that meet your expectations for quality, it will count for little if the software is frustrating to use. At Cahoots, we believe the process of designing a photobook should not only be easy but also fun. That’s why we have placed a high value on selecting software that is easy to grasp and fun to play with. We are excited to announce that we are introducing new and enhanced software that is fully capable, intuitive to use, and runs on both Windows and macOS. Our new Cahoots Easy Designer software will replace our Cahoots Easy Editor on Windows and Cahoots Pizazz software on Mac. So what are the important key features of our new design software? Fill and stroke image border – click to view full size. It is cross platform, so the same software can be deployed on Windows or macOS. Switching between computers won’t require learning a new tool. Files created on one platform can even be opened on the other. Invoking “Expert Mode” unlocks a number of more advanced tools (just like Creative Mode in our legacy Windows software). Images, page templates, and backgrounds are all drag and drop enabled, allowing a quick design process. Comprehensive alignment and distribution tools combined with grouping, copy and paste make custom layout creation a breeze. Digital sticky notes (that won’t be visible on your printed product) provide important layout advice related to bleeds and binding seams, or can be added as digital reminders for your own projects. Easily swap photos around on the layout by dragging their green handles. New backgrounds and semi-transparent page element capability – click to view full size. Apply drop shadows with the click of a button. Specify stroke and fill when applying borders, allowing the design of unique border styles. Backgrounds and borders can be coloured through sampling of any colour from your image, or indeed the entire screen. 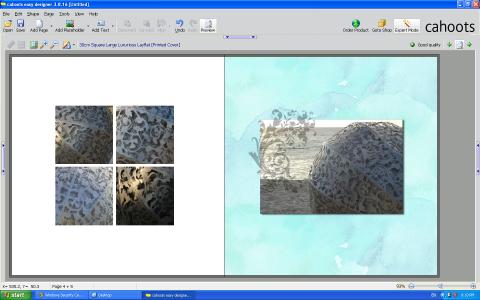 Backgrounds can also be created through tiling of images. Nearly every element can have its transparency property adjusted to give your layouts a more professional look. 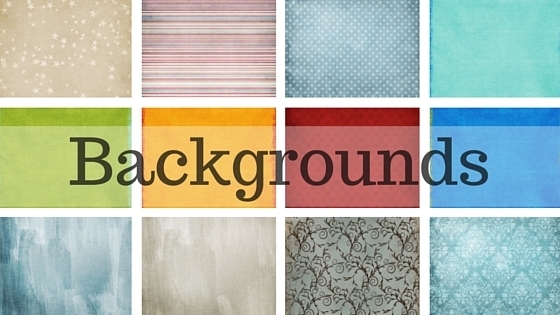 A wide variety of digital paper backgrounds and page elements are included in the software – or easily apply your own. New speech bubble page elements will add to the fun! – click to view full size. Handles additional formats such as PNG, allowing page designs to incorporate elements as superimposed embellishments. Feedback on image quality (according to the resolution) for any selected image on the page. Add or delete double pages anywhere in the book. Content for single pages can be cut and pasted elsewhere in one action. Book validation process alerts you to warnings and errors. The width of the spine on printed covers, as displayed on the cover layout, will adjust according to the page count. Image preview and basic image editing functionality is available within the application itself, so there is no necessity to use an external app for basic requirements such as red eye removal, cropping, adjustment of contrast, brightness, saturation etc. Validation, rendering and upload occurs on a page by page basis, and if the upload is interrupted, the software will offer to continue where it left off. Our new backend systems will now incorporate an online checkout process once your book is uploaded. No more waiting for emails or hunting through spam folders. Once your book is successfully uploaded you will be taken to the online checkout for payment. The same backend system will also keep track of VIP transactions, so registered users will always know how many points they will be earning, or how many they can use. Our new system is flexible, allowing us to add more products as the opportunity arises. Look out for calendars soon! Similarly, we can now provide options for you to configure your book. You can elect to have your book covered in one of our premium fabrics, directly in the software’s product selection wizard. Similarly you can also specify paper type (if applicable), the colour of end papers (i.e. inside covers), and whether you wish to have your printed book cover laminated in matt or gloss. Hopefully you now share our sense of anticipation and are itching to try out our new Easy Designer application. Our brand new software is new to us, but it is quite mature, having been around for many years. The current Cahoots Easy Designer v3.8 is in “soft launch” so we are requesting that customers register their download so we can keep in touch in case of any unforeseen issues (which we are not expecting!). If you would like to test it out, please do go for it! 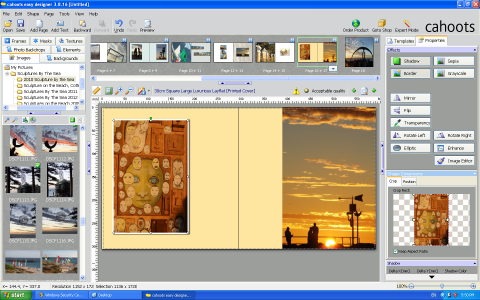 Apart from choosing the images for a photobook, perhaps the next most critical decision is what book format to choose. If you change your mind after you have started designing your book, you will typically find that the software will not allow a change of book dimension. At Cahoots we offer 2 square formats and 2 landscape formats, and in this article we offer some suggestions for the most suitable book format for particular topics, and some considerations that might help you narrow down your choices. Being our smallest offering, this format may be the preferred option if price/budget are paramount above all else. However, it is certainly the case that larger sizes do normally offer better value in terms of cost per square cm. If considering a Small Fun, we would recommend keeping it relatively thin. The Cahoots software will allow 100 pages for standard paper in this format, but we would recommend going no more than half this, preferably much less. The reason for this preference is that the pages have a tendency to want to close up, so one must always hold the book and pages firmly as the book is being viewed. The lower the page count, the less of an issue this is. An A4 Classic Landscape is worth considering as an alternative, as the weight of the extra page width partially mitigates the tendency of pages wanting to stay closed. Some people simply have a strong preference for the small compact format, in which case we would suggest considering upgrading to the layflat option (for up to 60 pages), as it negates the issue of “gutter bulge” and also removes the issue of the pages tending to spring up vertically. The Small Fun format lends itself well to recipe books, farewell books, short trips, Instagram portfolios and gift books. Being one of our most popular formats, the A4 Classic Landscape is the perfect choice if you expect the book to be stored in a bookcase, as the height of the book should fit in standard shelving (however, if important, you may want to check the depth of the shelf). Being rectangular in shape, it is well suited to landscape images in full bleed (i.e. no page margins). However there are plenty of layout possibilities for portrait and/or landscape combinations. Being rectangular in format, unless you have panoramas, there is less opportunity for dragging images across the binding (as this will normally result in cropping from top and/or bottom of the image). In this book format, the Cahoots software will allow up to 200 pages of standard paper (60 for layflat). However, as with the Small Fun, unless you are a fan of thick books, we would normally recommend a 72 page maximum for best “usability”. The A4 Classic Landscape is a very versatile format, and lends itself to virtually any photobook topic, whether it be a travel book, event book, personal history, school project, baby book or just a simple portfolio. The Large Luxurious is a format that can serve a dual purpose as both coffee table book, as well as still allowing for bookcase storage – typically in the bottom or top shelves with other tall books. Maximum page count for this format is 200 pages (60 in layflat). The same comments on page count apply here, as for the A4 Classic Landscape. The size of the Large Luxurious book implies a topic of special significance. Consequently this format is frequently chosen for weddings, travel books, family histories, family yearbooks and milestone birthdays. The Large Landscape is way to big for any bookcase, so this format is usually chosen when one wants to make a real statement, since this book will normally find a home on a coffee table, or stored carefully away in a custom made presentation box (available in matt black finish from Cahoots). Due to the heavier standard paper (200gsm) used for this format, the maximum page count in the software is 140 (60 for layflat). But once again, for reasons explained previously, we’d recommend a page count of no more than 60, if possible. All the layout advantages/considerations for the A4 Classic Landscape, apply to this big brother version. Keep in mind though, that your images will be much bigger in this larger format, so your source images will need to be of sufficient resolution (if you want to make any of them full bleed). Similarly, if any of them are not quite in perfect focus, seeing them in a larger size may make that more obvious. It is worth taking extra care to properly inspect your chosen images in detail to ensure you will be happy with the resulting printed images in the book. Large Landscape is well suited to portfolios, family portraits, travel books, in fact any topic where the book designer wants to create a photobook that simply demands attention by virtue of its size. Now I want to change my format – what now? Most photobook software will not let you change format mid-stream. The reason being that it is not easy to change from square to rectangular, or vice versa. Assuming you did not want your images cropped, or stretched or squeezed, you would not end up with a useful conversion. Some software will let you move to bigger or smaller versions in the same relative dimensions, but that comes with some potential issues concerning optimal image print resolution. Nevertheless, there may be occasions where having started with a particular format, one realises that a better choice would have been something different. The immediate response is to count the number of hours you have spent on the book to date, and the thought of repeating all that effort may be just too daunting. BUT, most of that time has probably been spent thinking about what photos go on what page and other design considerations such as backgrounds and borders, and possibly some text. While there is no denying that restarting project will consume some additional effort, you may be surprised how quickly you can re-create the book in your new format. For Cahoots software, we would recommend making a proof version of the existing book that can be displayed in a different window (web browser on Windows or Preview on the Mac). 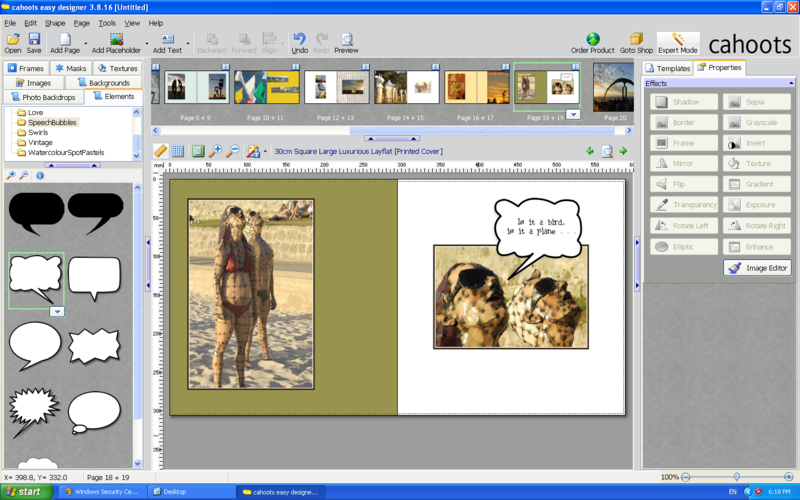 Start a new book with Cahoots software, and simply go page by page, choose the same photos, backgrounds etc. It may not be such a huge task as you had envisaged, and you may come to the conclusion that it was worth it in the end. If you need to downsize from Large landscape to A4 Classic Landscape, or from Large Luxurious to Small Fun, Cahoots may be able to assist in these circumstances, for a nominal processing fee. Contact us if this service is of interest. Hopefully this article has provided some useful information to help you decide which format to select for your next book. If we’ve confused you, or you have more questions than answers, you may find it beneficial, if feasible, to visit our Subiaco store, where you can see for yourself some of the practical issues we have touched upon. You’ll find a range of sample books on various topics that may help in you in your decision making process as well as giving you some design inspiration. If you can’t make it to the store, feel free to reach out to us via our contact form and we’ll do our best to answer your queries.